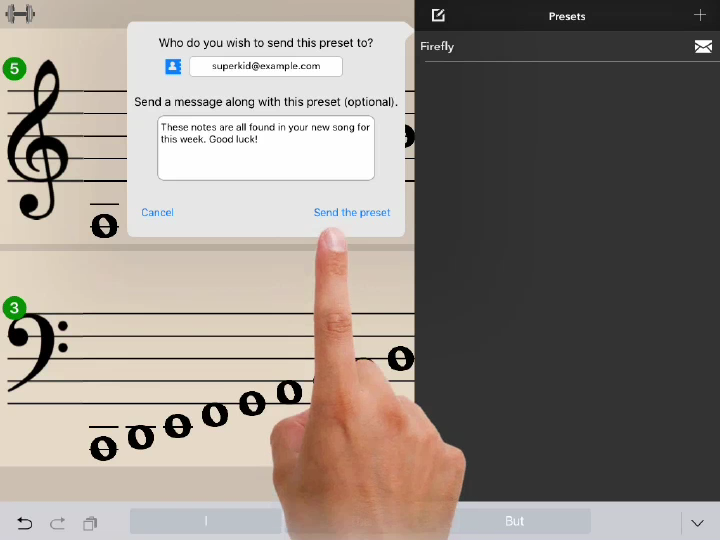 You can send a preset drill of the notes your student needs to practice at home. When they tap on the e-mail, Flashnote Derby will open with everything set up for them! Next to the preset you wish to send to a student, tap the email icon. In the fields provided, type the email address of the student you wish to send the drill to. If you like, you can add an optional message. Email address from contacts You may tap the contacts icon to choose an email address from your device’s contacts list. Creating Preset Drills If you need help with creating a preset drill, follow these steps. User Account Required In order to send presets to students, you must have a teacher account registered with us. If you did not create a teacher account the first time you launched Flashnote Derby, follow these steps to do so.